If you have any questions or suggestions you are welcome to join our forum discussion about Trading Failed Breakouts at Session Open . As we know, unlike the stock market which closes each day and reopens on the next, the foreign exchange market works around the clock apart from the weekend and it doesn’t have such pronounced opening sessions. For example, the shares of a company which releases vital information after the stock market has closed, will most likely gap as the market reopens on the next day and will, at least initially, perform a very strong move. This opens up many possibilities for traders to hop on the market and deploy their trading strategies. Although the Forex market does not close during the working week, it tends to display similar, albeit much more muted, behavior in the transition during the different trading sessions as major market participants (such as banks) begin their working day and join the market. If you want to learn more about the different trading sessions and their characteristics, read our article “Trading Sessions“, as well as the following three lessons which provide individual information for each of them. By now you should know that European trading accounts for the largest volume. Thus, you can expect that often the market will spike and perform breakouts in the transition between the Asian and European sessions. In general, the currencies with most traded volume are of the countries who participate in a given trading session. Thus, the Japanese yen will be most traded during the Asian session, while European currencies such as the euro, British pound, Swiss franc etc, and the US dollar and Canadian dollars will be most traded during the European and US sessions, respectively. Additional volume is seen during the overlap of the trading sessions, thus for example the EUR/JPY cross will see most volatility when the two respective sessions converge. Don’t forget to aim for the most liquid crosses. The failed breakout strategy we are about to explain and test is based on such currencies and is used on a 15-minute time frame. However, there are several conditions that must be met before considering to use it. First of all, the market needs to be calm prior to the session transition, at best in a definable trading range. This trading range and the possible following breakout when the next session opens is what we will be looking for. Second, because trading volume spikes, a breakout is very likely to occur, but at first we must not do anything. It would be best if the breakout is small – up to 20-30 pips or a third of the average daily range at most. If the breakout is larger than that, as in greater than 40-45 pips, do not take the trade as it has a greater chance of being successful. Even if a reversal pattern forms, you should still avoid entering in its direction as it has a higher chance of bouncing off the previous resistance, which now acts as support, and generate a second entry signal. If the scenario plays out as described above, we have everything set for an entry in the opposite direction, provided we get a reversal bar pattern. Read more about reversal bar patterns in our article “Bars Signaling Reversal – Basic Features“, as well as the following six articles. Once we see that a reversal pattern is indicating a possible shift in price movement may be at hand, we enter in the direction of the pattern below its low, if it is bearish, or above its high, if its bullish. The stop should be placed on the opposite side of the pattern – below its low for a long entry or above its high for a short position. As for the exit, you can either use a trailing stop with a fixed or a percentage value, or you can exit as a new reversal bar pattern forms in the opposite direction of your trade. Your trade stands a better chance of being a winner, if you enter in the direction of the larger-term trend. 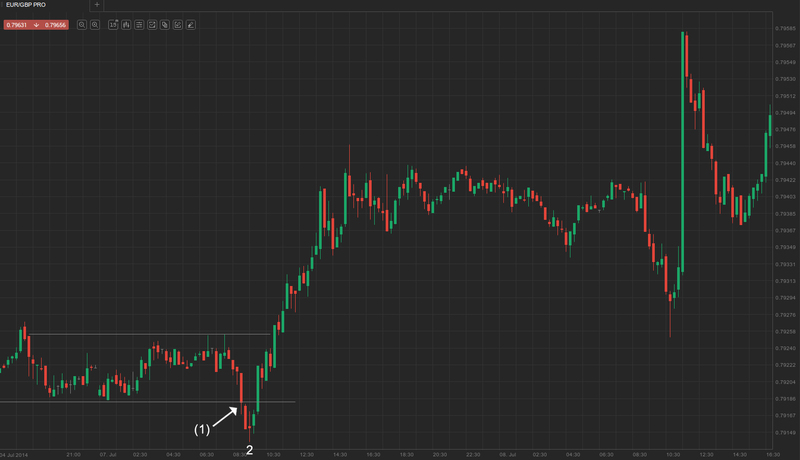 You can switch to a higher time frame (hourly or larger) and enter only trades parallel to the general trend. This way the breakout you are fading will be against the general trend, bringing the odds in your favor. On the screenshot above we used a 15-minute EUR/GBP chart. A suitable entry point was presented here, but keep in mind that the general trend was bearish, so for the example we will disregard the suggestion above to consider entering predominantly in the direction of the larger time frame trend. The low which was hit was the weakest level since October 2012. As you can see, the market was in a tight consolidation area during the Asian trading session. As European players began to join the market, it broke out through the support line at (1) at 0.7918 and fell to a 22-month low of 0.7914. However, there was no follow-through selling as the multi-month low acted as a strong support, which rendered the minor breakout failed. A sign of waning momentum was the doji bar 2, which was followed by a bull trend bar and generated a long entry signal. We enter above the high of the doji bar at 0.7917, while placing a stop 5-10 pips beneath its low at 0.7904 pounds. As the price moves higher, we trail our stop up. It can be adjusted by either using an absolute value of pips or a percentage basis. You can also trail it higher beneath the low of each closed bar whose high extended to a new swing high. Alternatively, as soon as you achieve a profit of 100% the amount risked you can scale out with half of your position and move your stop to breakeven, while leaving the other portion on the market until you reach double the amount risked.